Graphs have numerous practical applications — not just in the technological arena, but across various industries. You might use a graph to map out the overlapping connections in your Facebook friends list, for example, or to trace the source of contamination in a particular supply chain. But putting together a graph that processes data in a logical fashion can take a significant amount of time — until now, that is. RedisGraph is one of Redis Labs’ newest modules, and it can speed up graph-based calculations by up to 600 times. It is supported by GraphBLAS, an open source tool that employs linear algebra algorithms, such as matrix multiplication, so that you no longer have to execute complex calculations on your own. With the assistance of GraphBLAS, RedisGraph can create over one million nodes and form three million relationships in under half a second. Although RedisGraph is still an extremely new resource, it can save you an extraordinary amount of time and energy. RedisGraph goes against the grain and challenges the industry standard by using adjacency matrices — rather than lists — to store and represent graphs. It is true that an adjacency matrix can take up a great deal of storage space, but Redis has found a way to store adjacency matrices in a sparse format that is both memory-efficient and cost-effective. Download the ebook now to find out precisely how RedisGraph tackles this and other hurdles that arise with graph-based calculations. RedisGraph transforms the sparse matrices in GraphBLAS into graphs, which are then viable tools for real-world problem-solving. This is an especially important point: RedisGraph makes it possible to execute urgent calculations in real time. So, for example, if you find a contaminated batch of spinach and want to rapidly identify the source, RedisGraph will help you perform the necessary calculations in the shortest time frame possible. This way, you can remedy the problem and thereby return the supply chain to its original state without losing out on too much time and money. RedisGraph operates on the premise that graph-based calculations and data processing have real-world consequences — because they very much do. RedisGraph is Redis Labs’ attempt to make linear algebra calculations more accessible and efficient for anybody who may need them, without all of the disadvantages that have historically accompanied adjacency matrices. 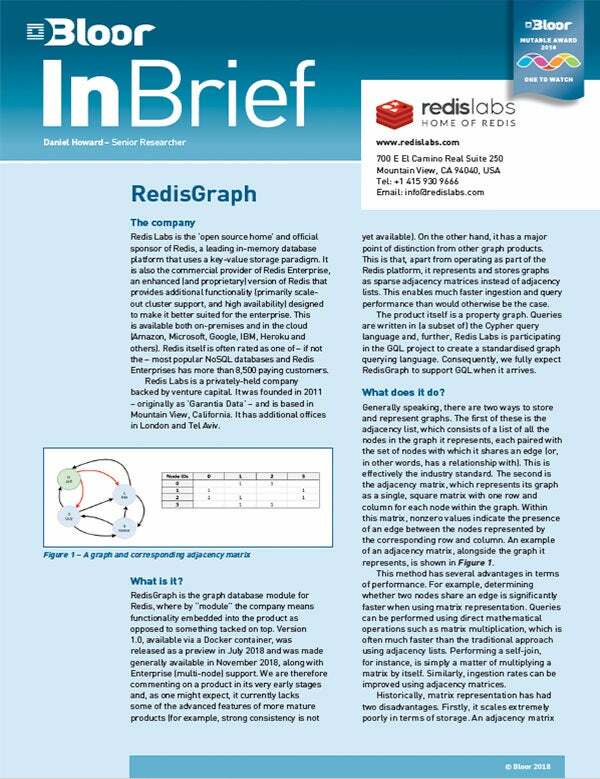 To find out more about how RedisGraph and GraphBLAS work, and how they might help you, please download the ebook.